HAMBURG/BRUSSELS (Reuters) - The multi-billion-euro costs facing Volkswagen (VOWG_p.DE) rose on Friday when the German carmaker said it would foot the bill for extra taxes incurred by drivers because it understated the carbon dioxide emissions of about 800,000 cars in Europe. VW's ability to push through its plans to make big spending cuts to pay for the emissions scandal was challenged by its works council, signaling an internal battle is looming at a company already assailed by regulators, investors and customers. The crisis, which erupted in September when Volkswagen admitted it had rigged U.S. tests for nitrogen oxide emissions, deepened this week when it said it had also understated the carbon dioxide emissions and fuel consumption of vehicles in Europe. In a letter to European Union finance ministers on Friday that was seen by Reuters, Chief Executive Matthias Mueller asked countries to charge VW rather than motorists for any extra taxes incurred in places where taxes were related to fuel usage or CO2 emissions. Some analysts have said that Volkswagen, Europe's biggest carmaker, could face a bill as high as 35 billion euros ($38 billion) for fines, lawsuits and vehicle refits in the biggest business crisis in its 78-year history. 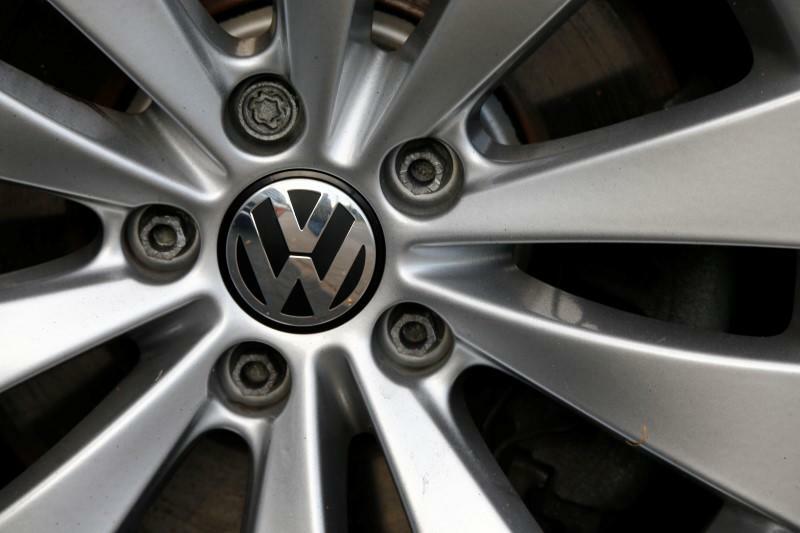 To help meet some of those costs, VW has announced a 1- billion-euro program of spending cuts. The head of its powerful works council said the announcement of the cuts had broken strict rules in Germany on consultation with workers, and demanded immediate talks with company bosses. "Management is announcing savings measures unilaterally and without any foundation," works council chief Bernd Osterloh said in an emailed statement. VW also confirmed a third senior executive was leaving the company, following the departure of the former chief executive and the manager who had been designated to run VW's North American business. Volkswagen said award-winning design chief Walter Maria de Silva, responsible for the Golf G7 and Audi A5 among other models across the group, was retiring at the end of November. It did not name a successor. German business daily Handelsblatt, citing company sources, had earlier said the company planned to cut costs in de Silva's department, which spends around 100 million euros a year. VW did not comment on the report. Since the emissions scandal began, Volkswagen has been criticized by lawmakers, regulators, investors and customers frustrated at the time it is taking to get to the bottom of a crisis that has wiped almost a third off VW's market value. "Volkswagen is so far not handling the scandal correctly," Mary Nichols, the head of the California Air Resources Board which is investigating VW in the United States, said in an interview with German weekly magazine WirtschaftsWoche. "Every additional gramme of nitrogen oxide increases the health risks for our citizens. Volkswagen has not acknowledged that in any way or made any effort to really solve the problem," she was quoted as saying. The case is "the biggest direct breach of laws that I have ever uncovered ... This is a serious issue, which will certainly lead to very high penalties," she said. The scandal has also piled pressure on European regulators, who have long been criticized by environmentalists because on-road tests have consistently shown vehicles emitting more pollutants than official laboratory tests. In an open letter, a group of leading investors urged the EU to toughen up vehicle testing. But the EU faces a battle, as carmakers have traditionally had a strong influence on policy in countries such as Germany, Europe's biggest economy, where they are an important source of jobs and export income. The European Commission, the EU executive, sent a letter to all 28 EU member states on Thursday urging them to widen their investigations into potential breaches of vehicle emissions. Vehicle testing in the EU is overseen by national authorities, so the Commission is reliant on each country to enforce rules. "Public trust is at stake. We need all the facts on the table and rigorous enforcement of existing legislation," a Commission spokeswoman said.